The Secondary School includes the stages of Logic (grades 7-8) and Rhetoric (grades 9-12). Incoming Logic students have mastered the Grammar of each subject (who, what, where, and when) and are growing in knowledge of and relationship with God. 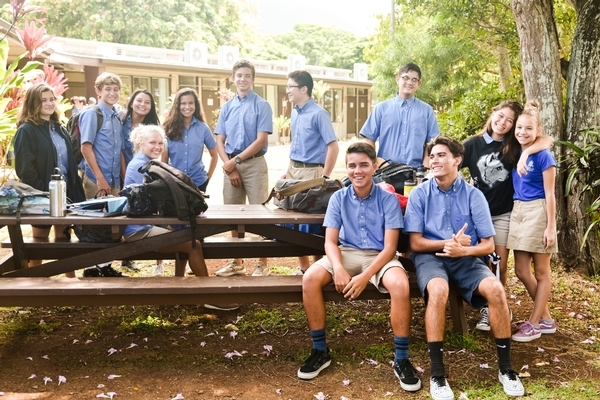 Trinity's Secondary School pairs rigorous academics with a Christ-centered focus that is integrated into every class. Download our Secondary School Profile. In addition to our academics, we provide our Secondary School students with a variety of electives, excursions (including a 2-week tour of Europe for our seniors), and the opportunity to meet and work with students in different grades through our house system. Our hope for every Trinity Christian School student is that he or she is united with Christ and committed to Him. This union and commitment are foundational for students to grasp their significance as a sinner redeemed by Christ. This awareness of identity helps students foster spiritual effectiveness and well-being. Scriptural Knowledge: students acquire a working knowledge of the Scriptures, learning to allow them to direct their thoughts and actions in every area of life. Academic Inquiry: students acquire a broad appreciation of creation, becoming familiar with valid methods of inquiry. Critical Skills: students develop the capacity for incisive, logical thinking. Rhetorical Skills: students begin and refine the clear communication of ideas in writing and speaking. Through Service Learning, students assume responsibility as servants of God. This includes opportunities of service within the school community, local churches, and the community at large. In particular, the secondary school annually participates in cleaning up Kawainui Marsh and helping plant taro. We learn service as a response to the call on our lives as summarized in Genesis 1:28 and Matthew 28:18-20. We are commanded to love the Lord our God with all our heart, mind, soul, and strength. Additionally, God is our Father in heaven with Whom we are called to relationship. We can neither fulfill the command nor enjoy the benefits of a relationship with God, unless we know Him through His Word. As partners with parents in that endeavor, we teach Theology. In our three-year cycle of Humanities, students study literature and history as integrated courses. Our Humanities program includes the study of ancient, medieval, and modern time periods. Students read, discuss, and write about the most important works of Western theology, history, and literature. Logical thinking and rhetorical skills are honed by participating in the arguments that have shaped Western Civilization. Students analyze and create essays, prose, fictional tales, and poetry of their own. Secondary Latin study combines Christian and classical content of both Latin language and history of the ancient world. 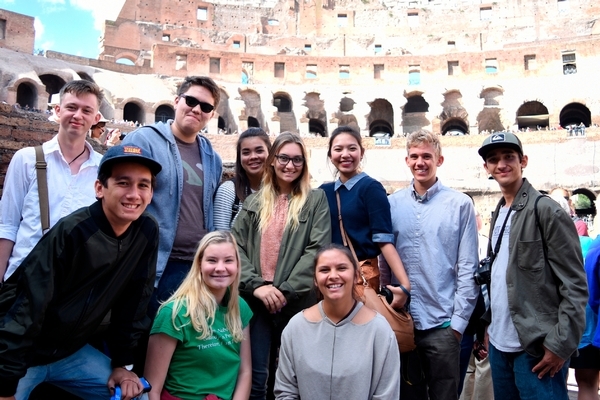 Students learn grammar, syntax, and vocabulary while studying Roman history and the differences between pagan and Christian worldviews. Latin study improves comprehension of English grammar and vocabulary and is a strong preparation to study modern foreign languages in high school. For more information about why we teach Latin, click here. The study of logic trains and sharpens reasoning skills. Students study informal fallacies as well as syllogisms and propositions to think clearly, reason well, and participate in rational discussions. These skills lay the foundation for a witness that is winsome. The heavens declare the glory of God, therefore the study of nature (the general revelation of God) reveals the truth about God. With this worldview, we embrace a robust exploration of all that God has created. Secondary students systematically study general and earth science, physics, biology of land and sea, chemistry, and human anatomy and physiology. Mathematics is an expression of the order seen in nature. Ptolemy wrote that the mathematical sciences were the best evidence of divinity because of their consistency and incorruptibility. Math study takes students beyond the observable facets of creation to the fundamental laws God uses to give order. Math, like sciences, reveals God through creation. Our students have an outstanding college attendance rate after graduating from TCS. Providing college and career counseling for all high school students helps them to research and weigh their college options. Our college counselor advises students in their early high school years and throughout the application process during their senior year. For many ages, the defining moment of a classically educated student’s career has been the presentation and defense of a thesis. At Trinity, the Senior Thesis is the culmination of our students’ high school education; it is a final expression of the knowledge and skills they have learned in the Grammar, Logic, and Rhetoric stages of classical learning. Each Trinity senior spends their final year researching a controversial and scholarly topic, which, in May, they are then expected to deliver a 20-minute presentation to an audience and panel of judges, as well as defend their thesis in a 20-minute Q&A session. A successfully executed Senior Thesis is required of all students to graduate from Trinity. Topics start with what each student is already passionate about, and is further refined throughout the year with guidance from teachers and peer editing from their classmates. This year’s topics included conversations around toxic masculinity, attachment parenting, the pay gap, and veganism. Ultimately, the goal of the Senior Thesis is an exhibition of our students’ ability to exhibit critical thinking skills, in-depth research, excellence in presentation style, and an ability to communicate effectively both from memorization and in a give-and-take exchange. Watch our Class of 2018's Senior Thesis Award winner, Torri Koizumi, below. Want to see other past thesis presentations? Visit the Vimeo site of WE Media Services here. Take a look at the planting project that Mr. Brian’s 10th grade humanities class and Mr. Fant’s 7th and 8th grade science classes are working on this year!